I can’t help feeling that Robin Williams was a victim of his industry: the happiness industry. Williams was typecast for those parts with manic, unstoppable joy. Listen up, Aladdin! Williams’ genie said, You’re not suffering from poverty”“what you need is a positive attitude! You know, put on a happy face! Let a smile be your umbrella! Our culture despises and fears unhappiness. We pathologize unhappiness; we conflate it with a disease, “depression.” And it’s a disease we insist you can cure”“so you don’t spread your unhappiness germs to the rest of us. We stigmatize those who are unhappy, like we stigmatize those who are overweight: If you’re fat, you just don’t have any self-control. If you’re unhappy, it’s your personal failure to just buck up. We laud the congenitally happy, like Ronald Reagan, the chipper Gipper, the Grinning Grandpa, who could unleash his death squads and smile all the while. We are a nation of salesman, commercially optimistic. We don’t like downers; we don’t like people who spoil the party. And so we push those who find themselves unhappy to medicate themselves”“avoid The Deep, get out of the blues and join the Disney. Williams chose booze, pills and that most devastatingly addictive drug, fame cocaine. 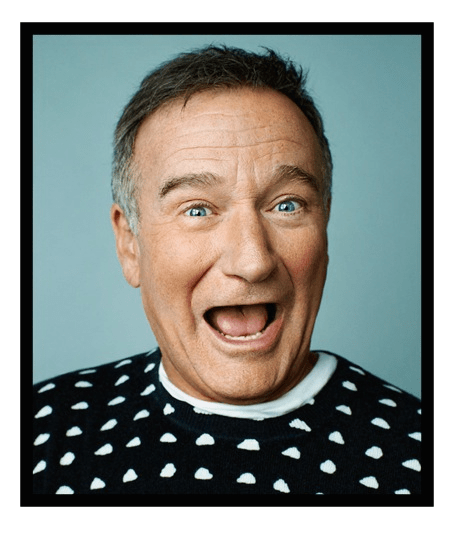 Robin Williams wasn’t depressed. He was unhappy. Life, even with your own jet, is sickeningly unfair and difficult. His disease was the human condition. There is no cure. It is always fatal. Like Robin Williams, Goethe’s Faust suffered through fear of the unstoppable horror of aging, the ineluctable withering of talents and fame and sexual power. A stone-deaf God has sentenced us to our inevitable decay and execution. Before you’re ready: bam! ”“ you’re 63 and suddenly, darkness falls”“Walpurgisnacht, the Dark Night of the Soul. The trick, says Goethe, is to hold on until morning. In dawn’s dirty light, we find this barely breathing compensation: gratitude for those that have loved us, not just applauded us. It used to be called Wisdom. And, at the last hour, Grace. But in our Disney’d world, that deepest unhappiness simply cannot be tolerated, not even for a night. So, we give up the dark night at the cost of giving up our soul. Forgive me, but I never found Robin Williams funny. He always seem to try too hard, to yuck it up too easily and too much. I found his film persona manic, disturbing and false. The funniest comic writer I’ve known was Charles Bukowski. To him, The Darkness was Lady Death, with long legs and lots of sticky lipstick. Bukowski would tell the lady, the Darkness, to come on in, sit down. Let’s have a drink together. Bukowski died laughing. He recognized that the joke’s on us, with the same old punch line: Rest in peace, Mr. Williams. Rest in peace.